The perfect engineering makes this camera so sophisticated. We probably all know the Kalart Range finder, the Kalart Focuspot, the Kalart Flash and even some of us, the real connoisseurs, will know the Sistogun, but you never might have heard of the Kalart Press Camera. 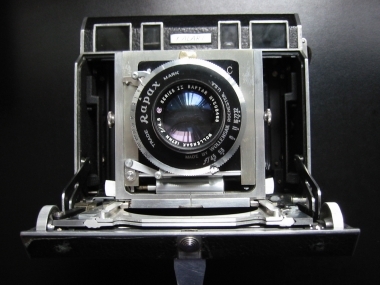 You wont find them as often as the Graflex, Burke & James or Busch Press Cameras. This very over engineered 3 1/4 x 4 1/4 press camera was designed by Mr. Morris Schwartz, the founder of the Kalart company. 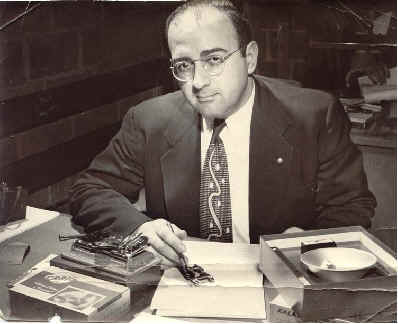 Chief engineer Ed Kaprelian, who joined the company after WWI. During war time Edward K. Kaprelian was head of the Signal Corp Photo Lab in Fort. Monmouth New Jersey and after the war he joined the\Kalart company as chief engineer and contributed to the production and planning of the Kalart camera. The Kalart company (Stamford CT) manufactured this camera from 1948 up till 1953. It is a remarkable and hard to handle camera equipped with a dual range finder, to allow use for left and right eye and a electric shutter control. No more blanks, no more double exposures. The camera came into my possession without a manual, so I had to find out the working by myself. I started by removing the front side by the four screws inside the housing and surprisingly, I suddenly had two parts of the camera in my hand. The front and the back. The back held the bellows, which I removed unscrewing its four screws . Now I could see the three copper contacts , connecting the bellows with the back side, Two on the right side and one on the left. The front of the housing holds the hinged drop bed and on top of it you can find the ingenious range finder which covers two view finders and the focus spot light. No wonder you can find here a lot of wiring, mirrors, connectors and other stuff. The power is delivered from three 1,5 volt batteries, in the battery holder beneath the 3 1/4 x 4 1/4 film holder back with ground glass and viewing hood, including a hinged magnifier for fine focusing! On the battery door it reads; "Kalart Test Camera on loan to Mr. Willard Jones." If anyone happens to know Mr. Willard Jones, please contact me, I'm desperately curious who that might be and why he was selected to test this camera. May be he was a famous Photographer. Never the less, this camera is completely "fool proof." Thanks to an ingenious designed electric circuit in combination with an even more ingeniously designed film holder, it is practically impossible to make blanks or double exposures. The only thing that might disturb your admiration for this camera is the ingenious focusing! However, It has to be said, that it works fantastic, once you know how to use it. 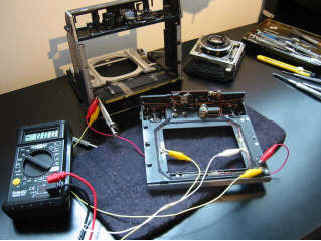 The picture above shows wire circuit testing, to find out how the electric shutter control works. On the lens board there is a tiny switch. If the shutter has not been cocked, the electric circuit is interrupted and disables firing ! Another provision has been used for the darks slide. If the dark slide has not been pulled, the electric circuit will be interrupted as well. This provision will protect the photographer for blanks. After exposure the dark slide can not be pushed back, without having it turned the other side upside down. The switch on the back feels if the Double Darkslide has been turned correctly for the next exposure thus preventing double exposures. Mini switch interrupting the circuit after "shooting." 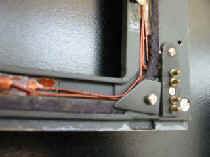 Picture on the right shows the three copper connectors on the below allowing to remove the bellows without having trouble with wiring. 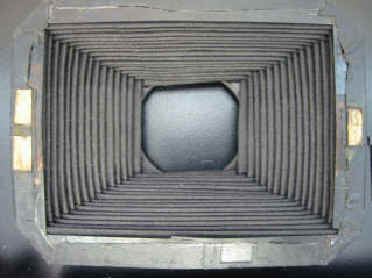 Once the bellows are replaced, they make automatically connection to the similar contacts on the body thus avoiding damage to vulnerable wiring. How they managed to bring the wiring from the back to the front, is a mystery to me. 1) Male and female connectors make it easy to separate and replace the two body parts without any problem. Almost a modern computer slot! 2) These connections are very solid and guarantee the good working of the electric circuit. 3) The "magic" dark slide. The upper edge is round and the lower edge is square , beside that there is a notch on the long side. 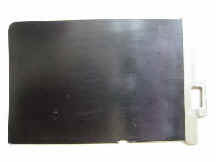 The chrome grip says that the dark slide has not been pulled out yet, so the film has not been exposed. On the other side the grip is black, telling us that the film has been exposed. 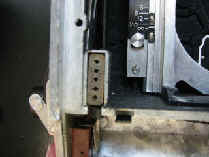 The dark slide cannot be pulled out again. The dark slide is part of the camera’s security knock out system. 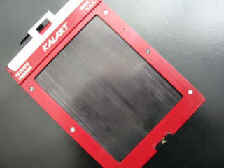 The 3 1/4 x 4 1/4 special Kalart film holder. A very clever engineering prevents that the dark-slide can be pulled out twice. 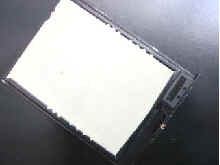 The interior from the Kalart Sheet Film Holder. By pushing the lock towards the center, the holder with the sheet film can be taken out of the red colored holder. After loading again, don't forget to turn the dark slide "chrome up"
It took twelve long years of research , development, experimentation and breakdown tests to get this precision instrument available for the professional photographer. The first camera with an electric circuit that prevents blank or double exposures. The concept was to incorporate all the improvements of the previous inventions in one camera, to minimize the mechanical worries, guard against human error and for all leave the photographer free to concentrate on the subject.